Update 05 Apr 2019 We use Dirham as a base because that is the home currency. 0.4423 is the rate on www.oanda.com (choose +4% Credit Card Rate). Trip cost is based on Emirates Airways estimated group fare of Rm3200 and will be adjusted up or down depending on final fares. We have been getting very good reviews from past travelers for its diversity of sights and experiences. Airport taxes about Rm300 is NOT included in the trip cost. This is meant to be a "free and easy" budget trip. Participants should be relatively fit, with a good sense of humour, and above all, have the right attitude for close travel with others through possibly some trying times. Most definitely, this is not a trip for prudes, whiners, fuss-pots, and other similiarly assorted types! Although every effort will be made to stick to the given itinerary, ground conditions may change and cause some disruption and/or deviation from the norm. Otherwise, have fun! We hire a Mercedes Sprinter with a local driver for the duration of this trip. We stay budget to mid-range accomodations except for the one night in a desert tent. Its quite important participants are able to manage their own luggage, preferably backpacks or softpacks and no "giant" luggages please. As on other Yongo trips, you pay for your own meals unless stated below, entrance fees, within-the-town taxis and other activities. 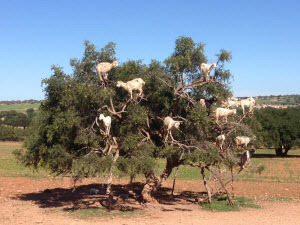 Morocco is sensory overload at its most intoxicating, from the sights, scents and sounds that permeate medieval Fes and magical Marrakech, to the coastal charm of its Atlantic Coast. From the high of the Atlas range and its abundance of mountains, Kasbahs, and friendly Berbers, to the stunning sculpted sands of the Sahara. 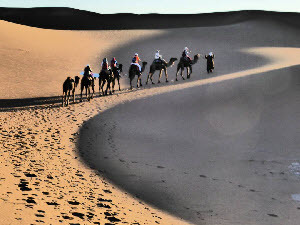 Morocco rewards you with the richness of its desert, the thrill of the hidden alleys in its ancient cities and its salty breeze along the Atlantic coast. Day 0 night: Meet up at KLIA by 10PM FRI 07 Feb 2020 for past midnight flight. Day 1 Casablanca: We fly 0110AM SAT 08 Feb 2019 on EK343 to DXB arriving 0430am (Flight time 7h20 Transit 2h55). We connect to EK751 DXB CMN 0725 1215 (Flight time 8h50) Arrive Casablanca 1215 afternoon. Our chartered van takes group to our hotel located in downtown. Rest of day free. 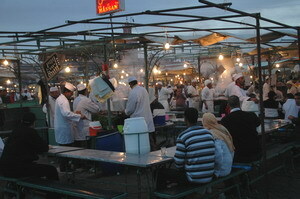 Overnight (O/n) Casablanca, breakfast included. Day 2 Chefchaouen: Early morning we wander about the Central Market before starting on out 5:30hr trip to Chefchaouen located in the Rif mountains in Northern Morocco. 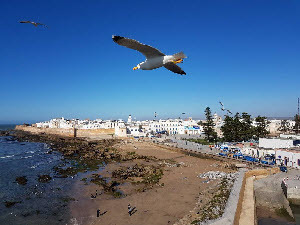 91km from Casablanca, we stop at Rabat, listed in UNESCO World Heritage, also the capital city of Morocco to visit the Kasbah of the Udayas, a well preserved fortress dating back to 12th century Almohad Dynasty. The Hassan Tower Mosque and across it the Mausoleum of Mohammed V. After lunch, we continue journey to Chefchaouen, also known as the Blue City with its blue-washed buildings, this town of 43,000 population is becoming a popular tourist destination. O/n Chefchaouen, breakfast included. 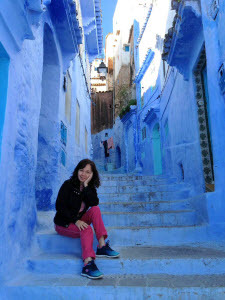 Day 3 Chefchaouen: We spend the day wandering about the Old town. Take a walk through the old medina and uphill to a "Lookout Point" infront of a Spanish mosque. Enjoy the breathtaking view over Chefchaouen and its surrounding mountains. This place is one of the best shopping places in Morocco. O/n Chefchaouen breakfast included. 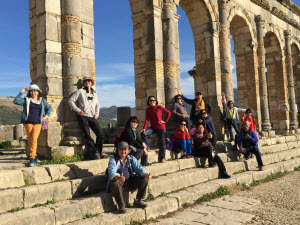 Day 4 Meknes: An early start to Meknes 5hr, with a stop at Morocco 's main Roman ruins of Volubilis, and a UNESCO World Heritage Site. It was an important Roman outpost which was founded in 3rd century as capital of Mauretania. We''ll arrive in the evening at Meknes, one of three imperial capitals of old Morocco. O/n Meknes breakfast included. Day 5 Fes: In the morning we have a guided half day city tour in this UNESCO listed historic city of Meknes, which is the least visited of all three imperial capitals. 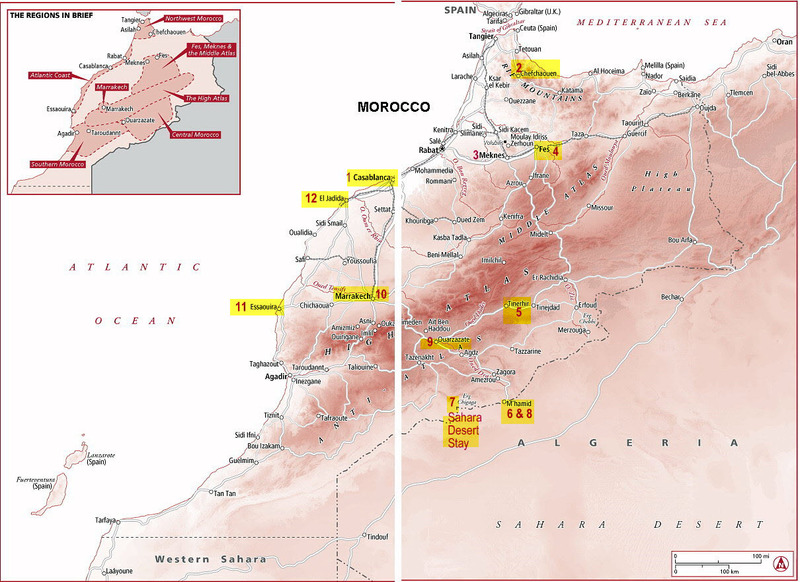 In the afternoon, we bus to Fes 1hr, Morocco's oldest imperial city and the 4th UNESCO World Heritage site on our travels so far. Fes was founded in 9th century, and it was a capital of Marinid Dynasty In 13th and 14th century. Fes hosts world's oldest university i.e. Univerisity of Quaraouiyin". O/n Fes breakfast included. Day 6 Fes: We will do a 3km guided walking tour of the old medina, taking about 3hours or so, and rest of day free to continue your own explorations of Fes. Be prepared for a labyrinthe of alleys and a riot of sights and smells, many of which has remained pretty much the same since centuries ago! Run riot on your own then! O/n Fes breakfast included. Day 12 Ouarzazate: We travel over the mountain to Ouarzazate 5hr. Ouarzazate is an oasis for film makers all over the world, hence, it is also known as "The Moroccan Hollywood". Upon arrival, we visit Taourite Kasbah, one of the best in Morocco as well as the Museum of Cinematography. O/n Ouarzazate Breakfast NOT included. 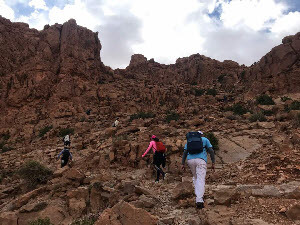 Day 13 Marrakesh: 30km outside Ouarzazate is Ait Ben Haddou, one of the most exotic and best preserved Kasbahs in Morrocco, and yet another UNESCO Heritage Site! Ait Ben Haddou has been featured in many famous movies including "Lawrence of Arabia, Gladiators, Indiana Jones" and many more. We move on to Marrakesh on a beautiful high mountain pass reaching an elevation of 2260 meters at Tizi N' Tichka. Total travel time 5hr. O/n Marrakesh Breakfast included. 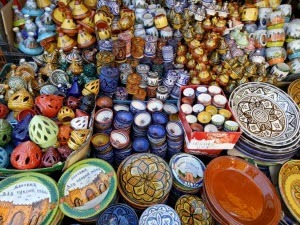 Day 14 Marrakesh: The epicenter of Morocco tourism, Marrakesh is meanderer's heaven. We take in the city sights, smells, and sounds in a half-day guided walking tour, and end the day at the Koutoubria Mosque. The medina of Marrakesh is listed in UNESCO World Heritage. 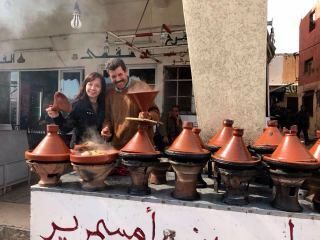 Djemaa el-Fna, a huge square in central Marrakesh showcase one of the world's greatest spectacle of food, fun, wares and everything else in a kaleidoscope of Moroccan vibrancy! O/n Marrakesh Breakfast included. Day 15 Essaouira: Bus 4hr to UNESCO World Heritage listed Essaouria, a late 18th century Portuguese fortified seaport town. Wander about the maze-like streets filled with interesting artisan wares and enjoy the breeze and sights of this Atlantic coastal town. O/n Essaouira Breakfast included. Day 16 El Jadida: In the morning, see more of Essaouira including the stone ramparts and canon turrets. After lunch 3hrs drive to the 8th UNESCO World Heritage site on our journey. The Portuguese fortification of Mazagan, now part of the city of El Jadida, 90-km southwest of Casablanca. O/n El Jadida breakfast included. Cost cover accommodation and traveling to sites mentioned above. Accommodations will be in budget to mid-range hotels or guesthouses. Not covered are tips,airport taxes (Rm300 estimate), meals Rm80 x 13 days total Rm1040, entrance fees (Rm200) and optional activities. Non-refundable deposit of Rm2200 is payable to confirm your place.